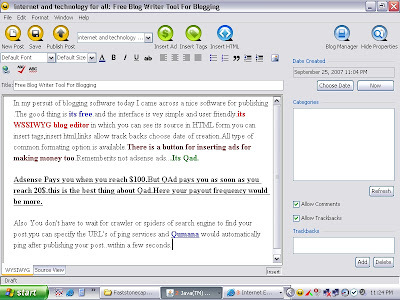 In my persuit of blogging software today I came across a nice software for publishing .The good thing isits free.and the interface is vey simple and user friendly.its WSSIWYG blog editor in which you can see its source in HTML form.you can insert tags,insert html,links allow track backs choose date of creation.All type of common formating option is available.There is a button for inserting ads for making money too.Rememberits not adsense ads...Its Qad. Adsense Pays you when you reach $100.But QAd pays you as soon as you reach 20$.this is the best thing about Qad.Here your payout frequency would be more. Also You don't have to wait for crawler or spiders of search engine to find your post.ypu can specify the URL's of ping services and Qumana would automatically ping after publishing your post..within a few seconds. Blogger community don't need to depend on adsense only for monetizing their blogs.Now you have one more option to earn money by selling your website/blog spaces for showing contextual ads.Enters Kontera! 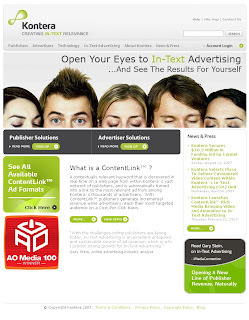 reach their most targeted audience on a Cost-Per-Click basis." 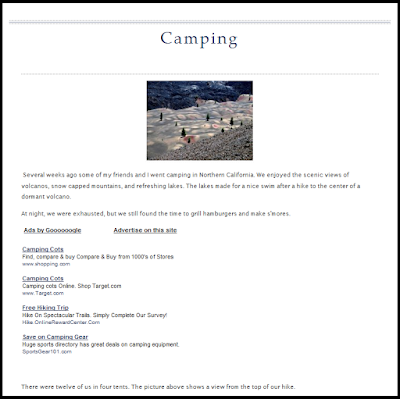 ContentLink provides five unique formats . Enhance your text message with an image or logo. Billboard, and place them directly into relevant content. ultimate video & audio experience.